You are here: Home / Reviews / My Sennelier Watercolor Review — Are They Worth It? 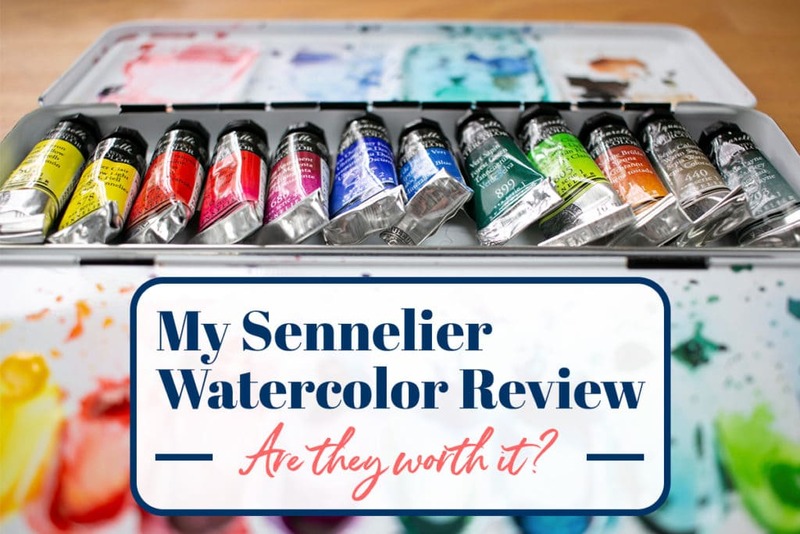 My Sennelier Watercolor Review — Are They Worth It? If you’ve been playing with painting for a while, then you might already know that watercolors rule. They create totally unique effects that no other type of paint can reproduce. And the act of using watercolors on the page? So dreamy! 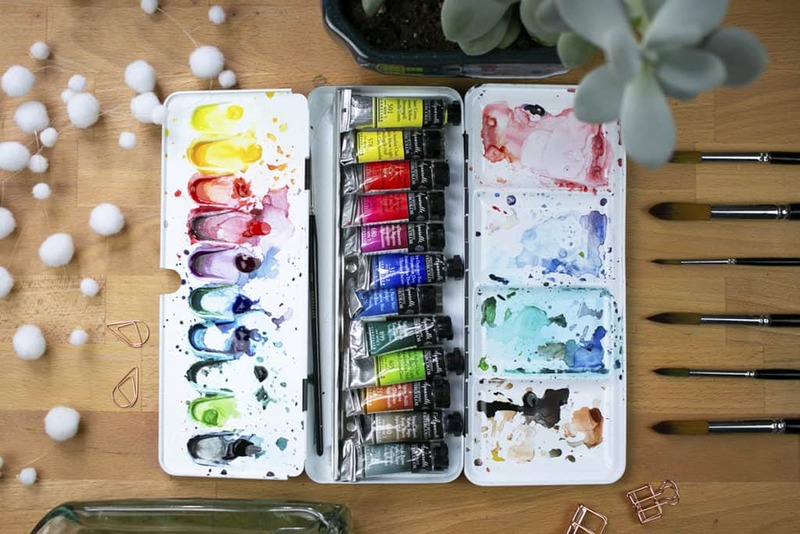 But whether you’ve been painting for a while or you are just dipping your toes, one thing is for certain — the range and expense of watercolor paints can be more than a little overwhelming. 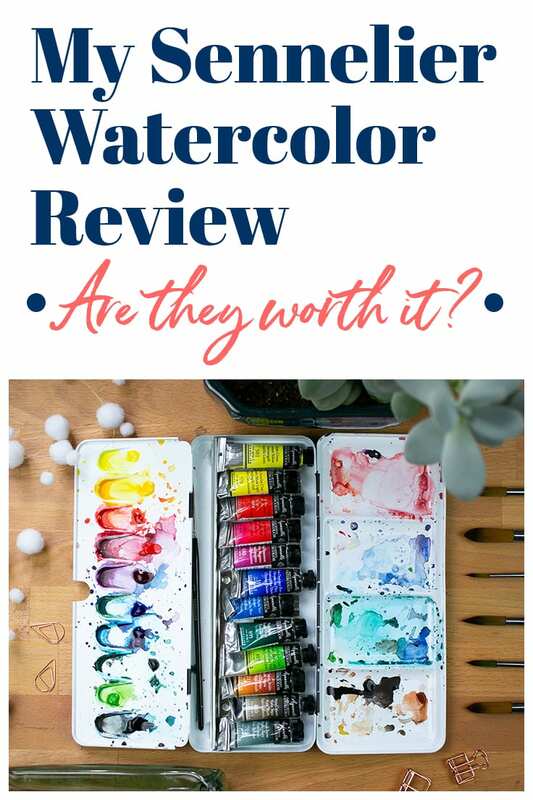 I have tried out a few different types of watercolor paints over the years, and there is one that I want to share with you today to discuss its merits. 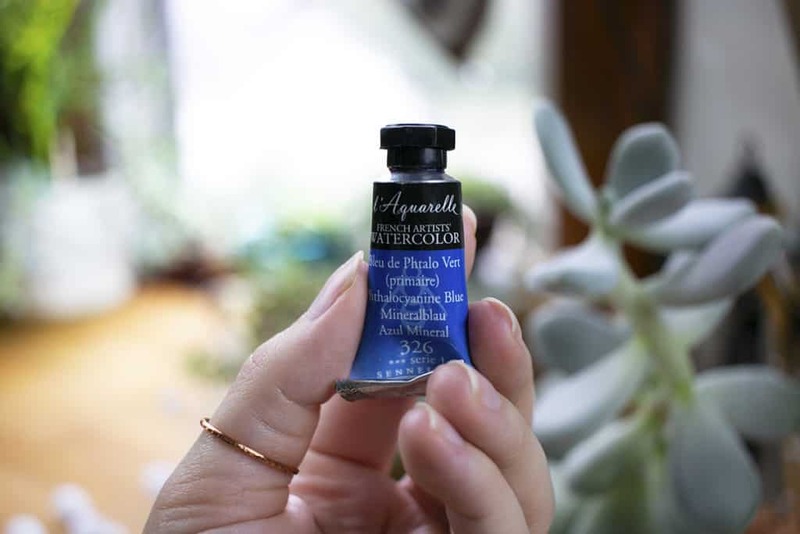 So get your paintbrushes ready for my Sennelier watercolor review! For a long time, my primary watercolor brand was Dr. Ph. Martin’s Hydrus watercolors. They are excellent and served my needs well for years, but there were a few downsides. 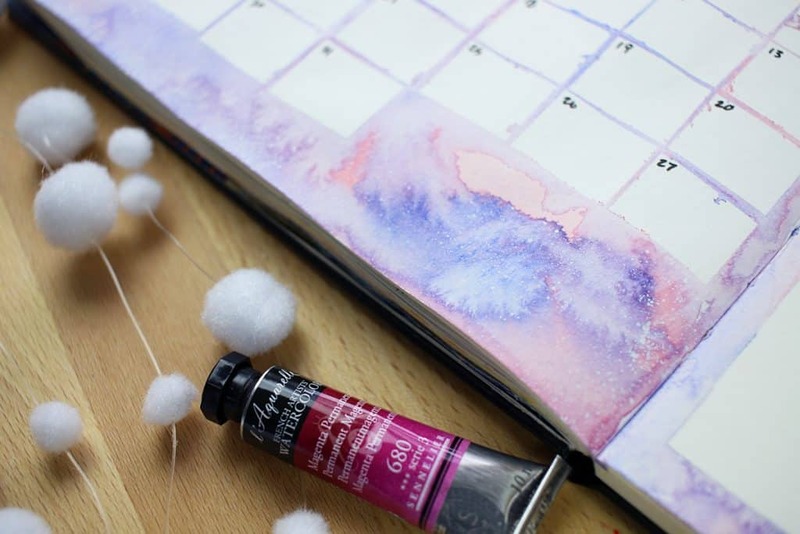 Around the time that I started my watercolor planner, I decided to do some research and look for a new watercolor experience. I dove into the wild world of watercolor paints in search of something that met some of my needs. That’s when I discovered Sennelier watercolors. After a bit of hemming and hawing, I finally purchased them. And boy were they different from anything I had ever used before. While I’m sure some store somewhere out in the big world stocks Sennelier watercolors, I have never seen this French brand here in America — at least not in person. However, it seems to be easily available on Amazon. I found my palette of Sennelier watercolors on Amazon. The type of palette I bought is from Sennelier’s artist quality paints, which shouldn’t be confused with their student quality paints. While I’m sure the student paints are lovely, student paints tend to not have as high-quality ingredients and therefore will behave differently when used. So keep that in mind if you decide to check out this brand! All of the links below go to artist quality paints, just so ya know. I bought the 12 tube set with a sturdy metal palette, but Sennelier provides several different palette options. The palette I am reviewing contains tubes, so any other palette that has tubes of paint should be extremely similar. It should be noted, however, that I have not tried Sennelier’s pan paint, which is simply watercolor paints that have been allowed to dry in a cake form. I’ve listed a few palettes below with both tube and pan options if you want to give them a look. 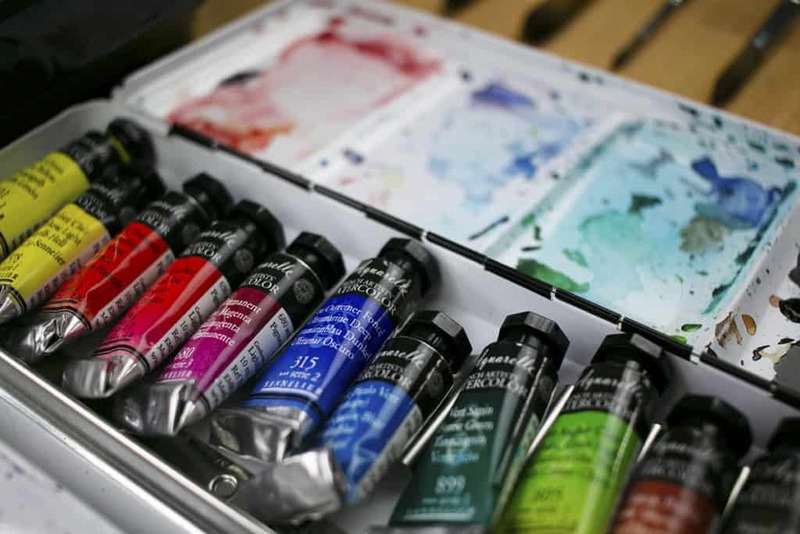 What makes Sennelier watercolors better than a cheaper paint set? Let me tell you a little about how these watercolors rocked my world. One of the very best things about Sennelier watercolors is the incredible granulation you can achieve. 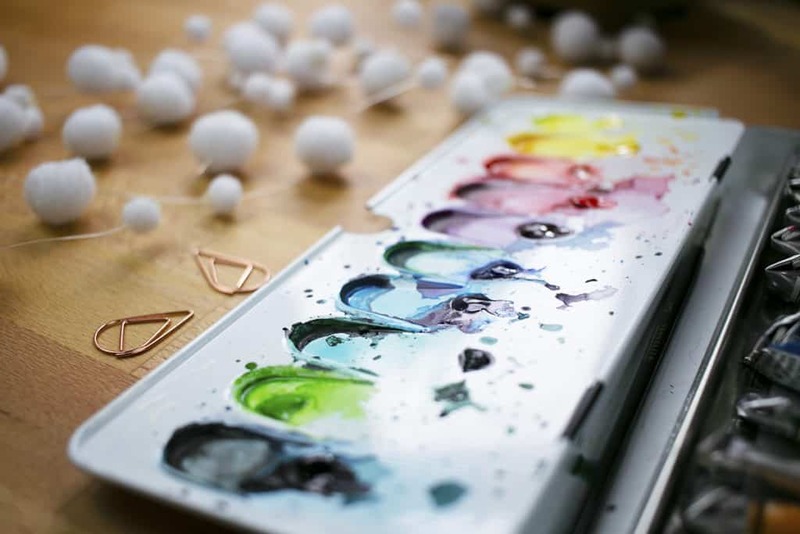 Granulation is when the pigment gets that grainy, textured look when it dries — which is often a way to tell that the paint was made with high-quality ingredients. Granulation is a trait that is sought after by many artists, but it is not a trait that all artists like. Personally, I love it! I wanted to give my art a little more grit and character with granulation, and Sennelier watercolors did an amazing job. Another characteristic that I was searching for in my watercolors was the ability to rewet and reuse it again and again. I wanted to know that when I squeezed the paint out of the tube that I could rely on it for many painting sessions. In the past, I’ve had some watercolor paints disappoint me and refuse to reactivate after it had dried in my palette. Sennelier watercolors, however, are champs at rewetting. The paints are made with honey, which makes them butter smooth and perfectly responsive to a paintbrush again and again. As one might expect from tube paint, the colors are bold and rich. The twelve paints I have are simply stunning. There are several variations in color, giving you a ton of color range for your art. Since my set of Sennelier watercolor paints only contained twelve colors, I need to blend them to achieve all the colors I want. I’m happy to report that these watercolors blend with ease and produce lovely mixes without any difficulty. Sennelier watercolors are the most expensive paints I have ever bought, so I was very concerned about getting my money’s worth. I didn’t want to run out of paint super quickly and have to buy more. Thankfully, since the tubes of paint are so concentrated, a little bit goes a long way. I have been using my Sennelier watercolors for over a year and I am not even close to halfway through the tubes. I’m sure I’ll have these paints for quite a while longer! One thing I enjoy much more than I expected is the metal palette. I have only ever had plastic palettes, so something as sturdy and dense as a metal palette feels extremely luxurious to me. It isn’t heavy, but it feels nice in the hand. Sometimes paint tubes are made out of plastic, but these Sennelier tubes are metal. Why is this important, you ask? Well, when you begin to use up the paint, you can trust the metal tubes to retain their shape as you roll them. Plastic tubes spring back, allowing paint back into the tail of the tube. If you pinch the tail of a metal tube to push paint out, the metal will stay where you pinched it so you can get out as much paint as possible. It’s another way you get your money’s worth with Sennelier watercolors. The metal palette that my paints are in is not particularly small, but it is compact enough that I can easily throw it in my backpack when I travel. It folds up nicely on itself, and as long as you don’t have sopping wet paints, everything should stay put. If I do decide that I want to travel with a smaller palette, I just need to squeeze the paint into the other palette. That way I can always have these high-quality paints on me as I travel. While I love these watercolors, there is one glaring problem that needs to be pointed out. The only con that I can possibly find with Sennelier watercolors is how expensive they are. 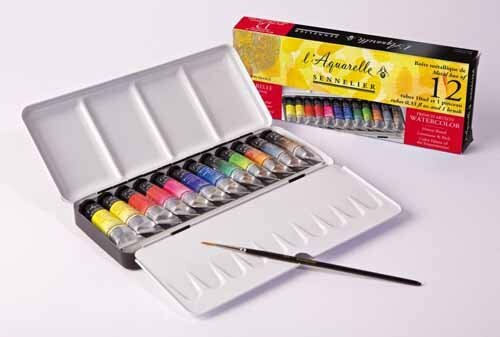 These are no kid watercolors — Sennelier watercolors are artist grade, meaning that they are suitable for professionals. And the price tag reflects that. If you are just getting into watercolors, then you might want to think twice before you get this set of Sennelier watercolors. Or, if you want to test this paint a little first, try buying a single tube and see how you like it. 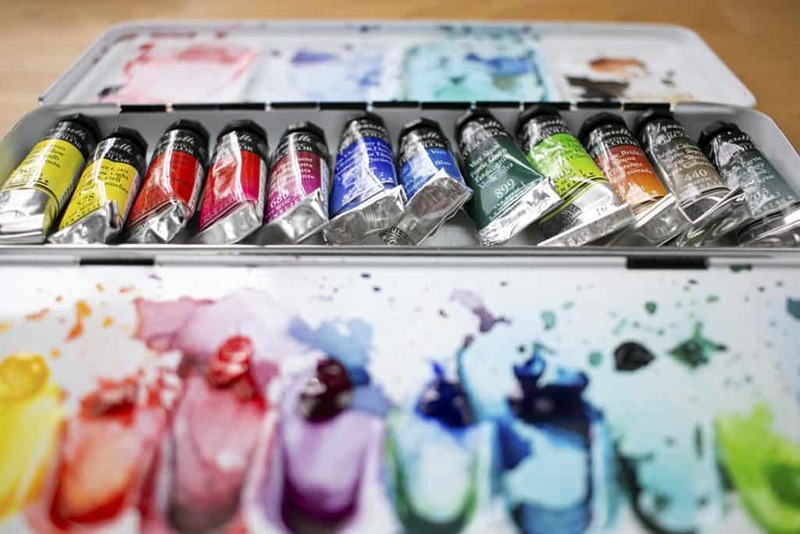 If you are an avid hobbyist, a professional artist, or you just don’t mind the expense, then I cannot recommend these fabulous watercolors highly enough. To me, they have definitely been worth every penny. After years of fiddling with watercolors and often feeling frustrated with their wild nature, I felt at home with Sennelier watercolors. You can never totally tame watercolors, but with Sennelier watercolors, you can rest assured that your medium won’t get in the way of your work. These paints have been an incredibly flexible tool to help me achieve the artistic effects I desire, and it’s nice having a paint brand that really can do it all. If you get yourself a set of Sennelier watercolors, know that you are getting a powerful paint that won’t let you down. I hope you have found this Sennelier watercolor review helpful! Let me know in the comments section what product you want me to review next, and head to the My Supplies page to see some of my other favorite materials! I remember well how frustrated I was learning watercolors. Everything else I learned fairly easily but watercolors were just washouts, literally. I’m not the bland painter type, so I just put them down as something I wasn’t good at. One day someone handed me a decent brush and some good grade paint and watercolor became on of my favorite mediums. I can hardly wait to try the Sennelier, thanks for the recommendation! Have you tried the Inktense sticks? Dyes, but lovely to do backgrounds with because they dry permanent, then you can go over them with watercolor. I think you will fall in love with them! Have a blast creating and painting.